For today’s students, learning at its best is a 24/7 enterprise comprised of a seamless set of engaging interactions with teachers, classmates, parents, and experts, some near and some far away. These interactions happen both in the traditional physical worlds of classrooms, libraries, and community centers, as well as in the virtual spaces of social media, massively multiplayer online games, and online classrooms. The ultimate learning experience is highly collaborative and yet, extremely personalized. The result of a deep immersion in this vision of education is a love for learning in its purest sense, and the development of a personal ethos within our students for the type of life-long, life-wide and life-deep learning espoused by the 2010 National Education Technology Plani and many education thought leaders over the past few years. This student vision of learning is inherently predicated on an understanding of the potential power of collaborative learning, the immense capacity of new learning environments when they are un-tethered to traditional methodologies or resources, and the unparalleled relevancy of learning experiences that marry academic content with real world context. As with most things in education, getting from vision to actualization is often a difficult and circuitous route. Such has been the case for demonstrating the capabilities of technology to address current education challenges. With an increased sense of urgency today due to the twin challenges of new curriculum standards and increased interest in preparing students with the skills they need for college, career and life success, many education leaders are re-visiting the potential of digital tools, resources, and content to transform the learning environment. Consequently, students who are effectively using digital tools to transform their learning experience place a higher value on the importance of technology as part of their personalized education process. The ability to use technology within school or class environments engages students in active learning and establishes a foundation for the development of a personal ethos of self-directed, independent learning. We hope that by highlighting the views and values of today’s students, and especially those students who are living a digital learning experience, this year’s report stimulates new discussions around the effective use of digital tools, resources, and content to support student learning. To do so, we are proud to introduce you to the incredibly interesting and provocative 24/7 digital lives of today’s learners. With the introduction of a variety of device types into the marketplace, anytime, anywhere learning enabled by the use of a mobile device such as a laptop, tablet or more recently, a Chromebook, has ignited the imagination of educators, parents, and students. Today, with wireless and conveniently-sized devices, students have personalized access to a plethora of learning tools, resources, and content while in school, at home, or even enroute to school or on the ballfield. Learning is no longer limited to only 8a.m. to 2:30p.m. each day, but rather can be extended and amplified beyond traditional school day hours. This benefit is particularly appealing as the nation discusses how to infuse additional academic rigor into the school curriculum, and at the same time, prepare students with the workforce skills they need to compete in the global economy. Consequently, many districts over the past few years have adopted various types of mobile learning initiatives within their schools. To support these goals, districts have also made significant investments equipping their students with school-provided mobile devices, enhancing Internet connectivity on school campuses, modifying policies to allow students to use their own devices, and adopting mobile-enabled content to support instruction. Accordingly, 47 percent of K-12 teachers in this year’s Speak Up data findings report that their students have regular access to mobile devices in their classrooms. The issue of digital equity and access, particularly in terms of out of school access to the Internet, is top of mind for many education leaders today. School and district technology leaders (47 percent) cite digital equity and students’ access to the Internet outside of school as one of the most challenging issues this year, and interest in providing students with mobile learning experiences that extend beyond the school day continues to rise among education leaders. In many cases, school provided devices, especially when equipped with 4G or wifi capabilities may be addressing at least part of the digital equity challenge. Among students who are using school laptops, tablets, and Chromebooks, 51 percent of high school students and 46 percent of middle school students note that their out of school Internet connectivity is through a mobile data plan. As we aim to address what Federal Communications Commissioner Jessica Rosenworcel calls the “homework gap,”ii these findings provide education leaders with a new awareness of the need for a multitude of connectivity options, both on campus and within the community. Increases in student interest in mobile learning have mirrored their escalating personal access to laptops, tablets, and smartphones since the beginning of the Speak Up research in 2003. Verifying the forward-thinking perspective of our students, students in 2003 ranked school-provided mobile devices as the number one technology component of their ultimate school. Today, the students’ vison for their ultimate learning environment follow the dimensions of current mobile learning capabilities; giving higher rankings for campus-wide Internet access (83 percent) and the ability to use their own mobile device at school (72 percent) rather than school-provided devices (55 percent). For most students today, their wish to use their own devices to connect to school servers anywhere on campus remains more visionary than reality. However, the experiences of students who are regularly using school provided laptops, tablets, and Chromebooks provides an interesting glimpse into the potential and future of mobile learning experiences. To help education leaders understand the mobile learning experience, we therefore examine the activities, attitudes, and aspirations of those students who are assigned school-owned mobile devices (Table A) to support their instruction as well as those students who do not have regular access to technology at school (13 percent of students in high school, 21 percent of students in middle school). Students with a personally assigned mobile device report greater usage of digital tools and resources to support schoolwork than students who do not have regular technology access at school or, in some cases, students whose primary access is through a computer lab, school library, or media center. 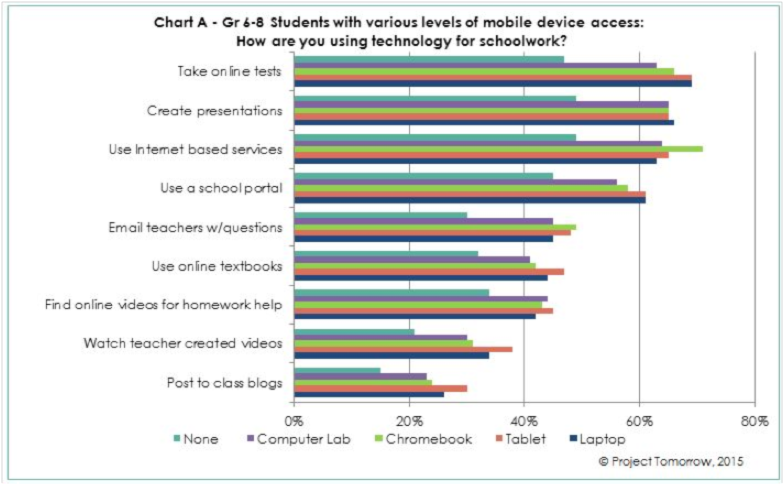 Chart A provides a snapshot of the differentiation in middle school student technology use based upon their access to three popular types of mobile devices as well as that usage compared to students who do not have classroom technology access. Providing a school mobile device to middle school students definitely changes the calculus of usage. Students with a mobile device, be it a laptop, tablet, or Chromebook, are more likely to use digital tools and resources both in school and out of school, than students without regular in-classroom access. The differentiation of usage by device type is minimal except for a few noteworthy exceptions. As would be expected, students with Chromebooks are more likely to use Internet-based services such as Google drive, Dropbox, or Turnitin.com (71 percent). More students with tablets report taking photos of school assignments or textbook pages (43 percent) than students with school-assigned laptops (22 percent), underscoring the value of tablet features and functionality to change the way we do things. The debate around which type of mobile device is the best for student learning has not abated this year. While educators deliberate the conceptual benefits of laptops vs. tablets and tablets vs. Chromebooks based upon the functional specifications and impact on school device management procedures, students who are using these devices every day for learning activities are becoming more informed and discriminating end-users. Not surprisingly, familiarity with using a device as a learning tool breeds a stronger affinity for that particular device as a preference in most cases. For example, students in grades 6-8 who are assigned tablets by their school are more likely to say that the tablet is the best device to take notes (50 percent), create videos (44 percent), or read an online textbook (41 percent) than students assigned a laptop as illustrated in Table B. 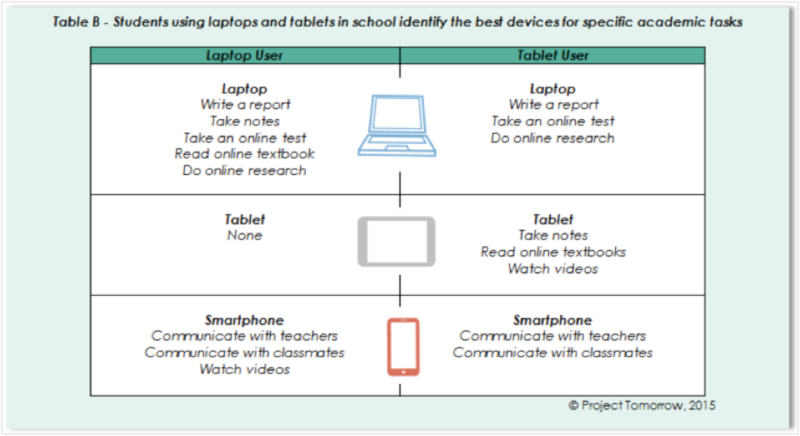 However, in some cases, students’ preferences transcend the type of device assigned by their school, and most likely reflect the experience that they have with these devices in their personal lives. Across the board, students see the smartphone as the ideal device for communicating with their teachers (46 percent) and classmates (72 percent) and for social media usage (64 percent). Additionally, laptops were the preference of middle school students, regardless of the type of device assigned to them, for writing school reports (87 percent), taking online tests (74 percent), and doing Internet research (59 percent). Students who are regular laptop users demonstrated the strongest preference for using that type of device for school tasks. Despite the seeming relationship between students’ use of a particular mobile device and their preference for using that device for school activities, students in general, either with or without device access at school, endorse the idea of mobile learning. With little differentiation, almost three-quarters of students with school provided laptops, tablets, or Chromebooks as well as students with technology access that is limited or non-existent at school, believe that every student should be able to use a mobile device during the school day for learning. And their parents and administrators agree as well. The appeal is universal. A key Speak Up 2014 takeaway therefore is that while students using mobile devices in school are demonstrating the efficacy of these tools for learning, students in classrooms all over the United States would like the opportunity to experience a mobile learning environment for themselves. As demonstrated by the most recent Speak Up reports, school and district administrators have a new sense of urgency regarding how to effectively leverage digital tools and resources to impact student outcomes. Whether driven by parental demands for increased personalization of the learning experience or higher goals for student achievement including explicit preparation for college and career success, many administrators are finding that blended learning environments hold great promise for addressing these needs. In fact, 45 percent of district administrators in this year’s Speak Up surveys indicate that the implementation of blended learning models within their district was already yielding positive results. Though this Speak Up finding is highly compelling, it is also widely recognized that the phrase “blended learning” can have multiple definitions and interpretations within a classroom environment. For purposes of examining the perceptions and views of students in blended learning environments, the Speak Up surveys this year leveraged the landmark work of iNACOL and the Christensen Institute to identify the core components of blended learning that would differentiate this approach from the occasional use of technology in the classroom or a fully online learning experience. The defining characteristics of blended learning are that it is a hybrid learning approach that includes both supervised learning in a traditional brick-and-mortar school and self-paced learning that is online when students have some level of control over time, place, path, and pace of their learning. Approximately one-quarter of middle school and high school students indicate on this year’s Speak Up surveys that they are learning in a blended environment that includes these core components (25 percent of students in grades 6-8, 23 percent of students in grades 9-12). Students from a variety of communities (rural, suburban, urban) are engaged with blended learning at similar levels. Only a slightly smaller percentage of Title 1 middle schools and urban high schools are implementing this approach for their students, based upon student reporting of their learning environment. Evidence also suggests that elementary schools are exploring various blended learning models. For example, one-fifth of elementary students in grades 3-5 (21 percent) note that they are regularly watching videos of lessons developed by their teachers outside of the classroom (a common practice within flipped learning, which is a version of blended learning). Administrators’ interest in blended learning is compatible with students’ interest in this innovative learning model as well. When presented with the definition and core components of blended learning, almost two-thirds of students in grades 6-12 (63 percent) agree that this would be a good way for them to learn. But, what is it about blended learning that is earning the attention and interest of these students? And how can administrators interested in this approach ensure that they are maximizing the benefits of blended learning as an agent for transforming teaching and learning in their schools? To address these important questions, let’s examine the activities, attitudes, and aspirations of students who are currently learning in a blended learning environment (the 24 percent of students in grades 6-12 identified through the Speak Up survey data) to provide new insights for schools and districts interested in these new digital learning approaches. As noted in earlier Speak Up reports, today’s students often function as a “digital advance team” for the rest of us, paving a new path for understanding the potential of digital learning. This is especially true for today’s students who are in blended learning classrooms. Students’ use of various digital tools and resources to support schoolwork provides a thought-provoking glimpse into the differences between learning experiences in a blended classroom and in a brick and mortar classroom where technology use is minimal or sporadic. As noted in last year’s Speak Up report, The New Digital Learning Playbook: Understanding the Spectrum of Students’ Activities and Aspirations, students’ use of technology can be categorized by both the driver of that usage (teacher-facilitated or student self-directed) and the location of the usage (at school or at home). In several ways, we see that blended learning environments transform the way technology is employed both in the classroom by the teacher, and by the student outside of school. The students in blended environments use technology more frequently than peers in traditional classrooms. This is most likely due to their enhanced access to certain digital tools and resources both in and out of the classroom, and how the teacher is empowering student-initiated technology usage. Students in blended learning environments are more likely to use online or digital textbooks, take online tests, watch teacher-created videos, and contribute to class blogs or discussion boards than their peers in traditional classrooms (Chart B). Additionally, these students are also more likely to self-direct their learning outside of school by tapping into mobile apps, finding online videos to help with homework, emailing their teacher with questions, and even posting online content they create for public commentary (Chart C). This increased usage of technology by students in blended learning classrooms translates into strong value propositions around the use of digital tools within learning. When asked to identify the benefits associated with digital learning, the majority of students in the blended environments note a strong linkage between technology usage within learning, the personalization of their learning process, and the development of college and career ready skills (Table C). For many education leaders, the blended learning environment seems to marry the best of both worlds – the engaging aspects of online learning with the personalized touch of the classroom teacher. Yet, just as K-12 schools and districts start to embrace blended learning, the variations in model and approach continue to multiply. While the flexibility and adaptability of blended learning is a positive attribute, those same characteristics make it difficult to assess quality and impact. Bringing the voices and views of students who are experiencing blended learning firsthand into the discussion adds authenticity and relevancy to the current discussions. A key takeaway from this year’s Speak Up data findings is that students in blended learning environments directly link the use of digital tools, content, and resources to important learning goals. As district and school leaders explore various models of blended learning, the insights and experiences of students in blended learning environments provide credence to the short term and longer-term validity of that specific learning culture. In 2012, the United States Department of Education defined virtual or fully online education as a learning environment where instructional materials and teacher-student and student-student interactions are facilitated over an Internet connection. As with blended learning, today’s definition includes a broader range of environments for K-12 students ranging from a “School of One” type experience where a student’s online curriculum is curated exclusively to meet his/her individualized learning needs to the Massively Open Online Courses (MOOCs) with class lectures delivered online to hundreds and even thousands of students simultaneously. From one to many, the common denominator is the online delivery mechanism. Though K-12 education has a long way to go to achieve Clayton Christensen’s prediction of 50 percent of all high school courses offered online by 2019iii, the availability of online learning as a viable choice for students is increasingly becoming a reality. According to the 2014 Keeping Pace with K-12 Digital Learning reportiv, 30 states now have a fully online school that is available statewide, and 26 states offer students enrollment in a state sponsored virtual school. High school principals report offering students online courses in a wide variety of subjects including the core subjects of Math (51 percent), English (54 percent), Science (49 percent), and Social Studies/History (54 percent). Only 27 percent of high school principals on this year’s Speak Up surveys acknowledged that they are not yet offering any online courses to their students. For the principals, the top benefits associated with online learning for their students focus on addressing individualized student needs in a highly effective, efficient, and engaging manner. Students are increasingly interested in an online learning environment. While only 8 percent of high school students indicated a preference for a fully online learning experience in 2013, 24 percent of the high school students in the 2014 Speak Up polling declared that they wish they could take all of their classes online. Students are particularly interested in taking an online class in their core subjects of Math, English, Science, and Social Studies/History, but students are also interested in virtual learning for computer science/programming and world languages with particularly high interest in those subjects among middle school students as illustrated in Chart D.
As many districts and schools have experienced, implementation of online learning for students has its challenges, however. Many education leaders express concerns about the quality of the students’ learning experience in a fully online or virtual environment. To gain an enhanced understanding of that experience, and to provide valuable insights to schools and districts implementing new models of online learning, the 2014 Speak Up data from students who are learning online exclusively is particularly meaningful. As one would expect, the digital experiences of the students in fully online learning environments are quite different from students in traditional brick and mortar classrooms. High school students in virtual schools are taking significantly more online tests (72 percent vs. 58 percent) and creating less PowerPoint presentations as a school assignment (43 percent vs. 70 percent) than other students. While today’s typical high school student uses their mobile device to snap a photo of some textbook pages to read later, the online student is already using online textbooks and content and thus this adaptive behavior is not necessary. The online students are watching more videos created by their teachers (41 percent) and over a quarter of them say they are regularly posting self-created content online for peer or public commentary and review (28 percent). Only 18 percent of high school students in brick and mortar schools are doing the same. Reflecting current trends, the online learner, like their peers in other learning environments, uses a wide range of social media tools for daily interactions with friends, classmates, and even teachers. Interestingly, the online learners are more likely to use social messaging apps, video messaging, and participate in special interest forums. In fact, students in virtual schools are twice as likely to text message their teacher with schoolwork questions (29 percent) than students in traditional learning environments (15 percent). Over one-third of middle school online learners (37 percent) and 46 percent of online learners in high school say that as a result of using technology they communicate more with their teachers. Similarly, the students note that they are collaborating more with classmates as well. Given that virtual learning environments rely upon technology as the primary delivery mode for instruction and interactions, they’re an interesting microcosm for examining the relationship between digital learning and student engagement. Whereas a majority of both middle and high school students say that using technology in their classes increases their interest and engagement in what they are learning, students in virtual learning environments express stronger agreement with that premise. For example, one third of Grade 6-8 online learners (35 percent) strongly agree that technology enhances their engagement in learning compared to 30 percent of students in traditional learning environments. As education and policy leaders continue to debate the merits of online learning as an alternative learning environment for K-12 students, many districts and states are instituting new policies that mandate students must have an online learning experience as a high school graduation requirement. The driver for these policies appears to be a strong interest in ensuring that today’s students are well prepared for college and career success. With more college instruction facilitated through online courses and employers calling for sophisticated technology skills in most new jobs, it makes sense that the implementation of these new policies is resulting in greater interest in online learning in many communities. A majority of parents (50 percent) and school district administrators (59 percent) agree with these policies. And while students in grades 6-12 have a lukewarm response to the idea of new graduation requirements of any kind, a majority of the students in online learning classes agree that every student should have an online learning experience to prepare them for the demands of college and future jobs, underscoring the value to their own education of a virtual learning environment. In many ways, students in virtual or fully online classes are experiencing digital learning in its purest form. They are in fact our test bed for understanding how the inclusion and integration of digital tools, content, and resources can transform learning processes and outcomes. When we examine these online learners’ views on online textbooks or social media tools, we are gaining unprecedented access into what may evolve as the future of education. A critical takeaway from this year’s Speak Up research is that the online learners so highly value their unique learning experience in virtual schools and classes that they believe that other students should also benefit from online learning and that state, district, and/or school policies should be in place to support that transformative change. There is no clearer statement of value than a desire to spread the wealth of the benefits to others. A key component of the national momentum around college and career preparation has been the confirmation of the importance of science, technology, engineering, and math (STEM) educational opportunities for all students. With leadership from policymakers, federal agencies, corporations, and foundations, multitudes of new programs and initiatives are underway to expose students to STEM fields and provide support in the preparation for jobs and careers in those fields. While a common definition of “STEM education” is still evolving, a few attributes are universally recognized as characterizing a STEM learning experience. STEM education is inherently interdisciplinary with a strong emphasis on the application of rigorous academic knowledge to real-world problem solvingv. That every student needs a solid foundation in the core subjects of science and math is undeniable for education leaders, especially given the new demands for a competitive workforce. However, connecting the dots from rigorous STEM academic content to real-world, contextual understanding is often a difficult leap for schools to actualize in practice. Given the difficulty associated with this task, evidence about the impact of these STEM learning experiences on students’ valuations of digital learning is also in its infancy. 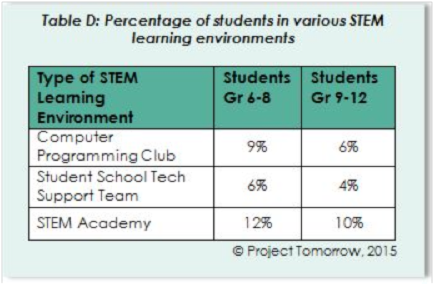 To explore the relationship between participation in STEM learning and students’ views on digital learning, let’s examine the Speak Up data from students in three specific types of STEM learning environments: students participating in after school computer programming (coding) clubs, students that are members of school sponsored technology support teams, and students attending designated STEM academies. The views of these students on digital learning in particular can inform new initiatives and programs. Before examining the data, however, it is important to note that within these environments boys are more heavily represented, with the most striking difference between girl and boy participation existing in computer programming clubs and student technology support teams. Only one-third of middle school participants in STEM learning environments are girls (38 percent). A similar pattern exists in high schools. The margin of difference is smaller in the STEM academies, but boys still outnumber girls by 11 to 16 percentage points. As discussed in previous Speak Up reports, gender continues to define both usage and aspirations for digital learning in many ways. Understanding the behaviors and attitudes of both girls and boys in STEM learning environments can help education leaders design and implement more equitable educational and career preparation experiences. Speak Up reports have long documented the gender disparity in STEM career interest. Reflecting a long-standing trend, this year’s data results reconfirm that bias with middle school girls 38 percent less likely and high school girls 32 percent less likely than their male peers to say they are very interested in a STEM career (Chart E). New Speak Up data this year also reveals a ground breaking trend regarding girls’ interest in learning computer programming or coding. Sixty four percent of girls in grades 3-5 indicate interest in taking a computer programming class or being part of an after school coding club, while only 50 percent of middle school girls and 38 percent of high school girls share that common interest. To lessen that declining level of interest, it appears that the sweet spot for engaging and then nurturing girls’ interest in computer programming as a gateway to sustained STEM interest may actually be in elementary school, a place where few such programs exist today. 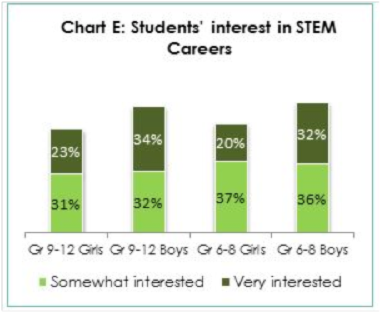 So, how do we change or alter the direction of such STEM interest trajectories? 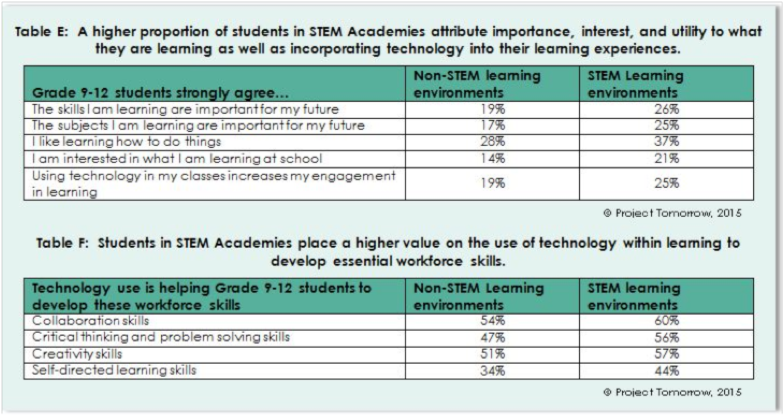 And what should administrators interested in STEM learning know to ensure that they are maximizing the benefits of these programs as agents for transforming students’ school experiences and self-efficacy as life-long learners? Three research findings emerging from this year’s Speak Up data provide new insights into how to address both questions. As we think about how to make STEM learning opportunities available to more students, these timely Speak Up results provide valuable input into the learning lives of students immersed in STEM learning on a day-to-day basis. The key takeaway from this year’s Speak Up findings is that students engaged in STEM learning place a high value on the efficacy of that learning environment to support their future dreams and aspirations and correspondingly, they are also more likely to exhibit self-directed learning behaviors outside school when exploring STEM resources. If our national goal is to create a curious, inquisitive, self-reliant STEM workforce, then these emerging innovators are already setting the pace for that kind of lifelong, life wide and life-deep learning. learning that is digitally rich in context and relevancy. While students’ motivations for and outcomes from these self-directed learning experiences demand additional examination, the importance of this emerging digital learning environment in today’s students’ 24/7 learning lives cannot be underestimated. Most notably for education leaders poised to implement mobile, blended, virtual, or STEM education initiatives, it is critically important to understand that today’s school no longer has a monopoly on learning experiences, even with the implementation of any of the reported innovative digital learning initiatives. Thus, two big questions emerge from this finding. Are we ready to support a new kind of educational ecosystem that acknowledges learning as a 24/7 enterprise, and what do we need to do today to enable and empower these kinds of student-centric digital learning experiences for all students? We look forward to continuing these important discussions with education leaders worldwide. i Atkins, D., Bennett, J., Brown, J. S., Chopra, A., Dede, C., Fishman, B., & Williams, B. (2010). Transforming American education: Learning powered by technology (National Educational Technology Plan 2010). Washington, DC: US Department of Education, Office of Educational Technology. iii Christensen, M. C. (2008) Disrupting Class: How disruptive innovation will change the way the world learns. iv Gemin, B., Murin, A., Pape, L., Vashaw, L., Watson, J. (2014). Keeping pace with K-12 digital learning. v Tsupros, N., Kohler, R., & Hallinen, J. (2009). STEM education: A project to identify the missing components. Intermediate Unit 1: Center for STEM Education and Leonard Gelfand Center for Service Learning and Outreach, Carnegie Mellon University, Pennsylvania. Speak Up is an initiative of Project Tomorrow®, the leading global education nonprofit organization dedicated to the empowerment of student voices in education. Each year, the Speak Up Research Project polls K-12 students, parents, and educators about the role of technology for learning in and out of school. This survey represents the largest collection of authentic, unfiltered stakeholder voices on digital learning. Since fall 2003, almost 4 million K-12 students, parents, teachers, librarians, principals, technology leaders, district administrators, and members of the community have shared their views and ideas through Speak Up. K-12 educators, higher education faculty, business, and policy leaders report that they regularly use the Speak Up data to inform federal, state, and local education programs. In fall 2014, Project Tomorrow surveyed 431,231 K-12 students, 35,337 parents, 41,805 teachers, 2,485 librarians, 680 district administrators, 3,207 school administrators, 442 technology leaders, and 6,653 members of the community representing 8,216 public and private schools from 2,676 districts. Schools from urban (30%), suburban (30%), and rural (40%) communities were represented. Just over one-half of the schools (56%) that participated in Speak Up 2014 were Title I eligible schools (an indicator of student population poverty). The Speak Up 2014 surveys were available online for input between October 6th and December 19th, 2014.